A small gesture can go a long way, especially if its dark chocolate filled with delicious creamy peppermint! Enjoy this loved winter treat, or better yet, make it the perfect little gift for a loved one. 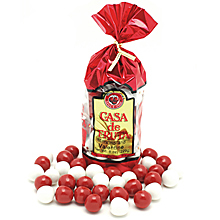 The bag includes creamy peppermint centers dipped in dark chocolate with a mint candy shell. Packaged in an 8 oz. gift bag.